Ambazhathil Karunakaran Lohithadas - Unmatched Personality. Malayalam Cinema have lost one of its famous scriptwriter way back 7 years ago. Death is the last word of the human life, but someone like Lohithadas's stature, it doesn't mean any importance because that much Lohi touched us with his brilliant stories. Not for us Lohi is friend to all core Malayalam language lovers. His films have touched millions of Malayalam cinema viewers. For Someone who loves Malayalam Cinema don't forget the characters, that Lohithadas scripted from his minds. All his film characters were deeply resemble the true Malayalee. Whether it is 'Aamram', 'Kireedam', 'Kamaladalam', 'His Highness Abdullah', 'Bhoothakannadi'. All these film's characters will remain in the hearts of every Malayalee. Every drop of ink from his pen creates memorable moments of Malayalam cinema. 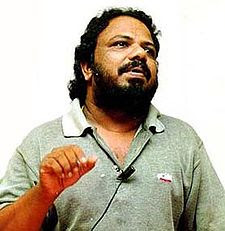 Lohithadas glows everything he touched, that he proved from his scripts and stories. He was known as one of finest scriptwriters, but he proved that he was a good director and lyricist as well. With his grace view about life, people like him still wanted to accomplish more for Malayalam film industry. 54 year's is not too much for Lohi to accomplish it what he wanted to do for Malayalam cinema. On the way of Malayalam Cinema history the name of Ambazhathil Karunakaran Lohithadas will be remembered forever, like never astonishing lamp. 13.Dhanam 14. Adharam 15. Kauravar 16.Kamaladalam 17.Chenkol 18. Vatsalyam. 19. Venkalam. 20.Salapam. 21.Thuval Kottaram. 22.Bhootakannadi. 23.Kanmadam. 24.Joker. 25.Vindum chilla vita karyengal. 26.Karunyam. 27.Ormacheppu. 28.Arayanangulde veedu. 29.Sutradharan. 30.Kasturimaan. 31.Chakram. 32.Kasturiman(Tamil). 33.Chakramuth. 34.Nivedyam. --National Award for the Debut Director(BHOOTAKANNADI.)-1997. --Kerala State Award for the Best Director(BHOOTAKANNADI.)-1997. --Tamil Nadu State Award for Second best film-(Kasturimaan-Tamil)-2005. SALUTE TO THIS GREAT GENIUS.